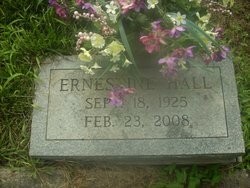 Mrs. Ernestine Hall, 82 of Huntington, widow of Ervin J. Hall, passed away Saturday, February 23, 2008 at the Emogene Dolin Jones Hospice House. She was born September 18, 1925 in Mingo County, a daughter of the late Jesse and Ivory Gilman Terry. She was a homemaker and a member of Lewis Memorial Baptist Church.